Many of you know we started our expatriate lives off teaching overseas in the United Arab Emirates. 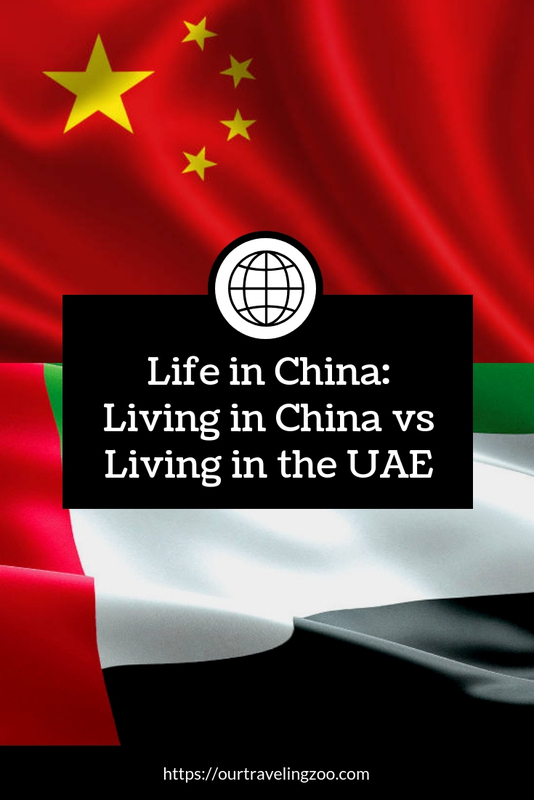 You maybe wondering the same question we find ourselves asked frequently: “How does living in China compare to living in the UAE?” Or perhaps, “How does teaching in China compare to teaching in the United Arab Emirates?” As it turns out, that’s a surprisingly appropriate question. So how does living and working in Shenzhen, China, compare to living and working in Al Ain, in the United Arab Emirates? In brief, despite lots of similarities and a number of stark contrasts, living in the UAE was easier. Here’s the in-depth explanation. For starters, in the UAE more English was spoken by locals and there were more English-speaking expats, as well. In fact, we were more likely to meet someone who spoke English in the UAE than Arabic. In China, Mandarin Chinese is unquestionably the dominant tongue, and English is only spoken by a handful. 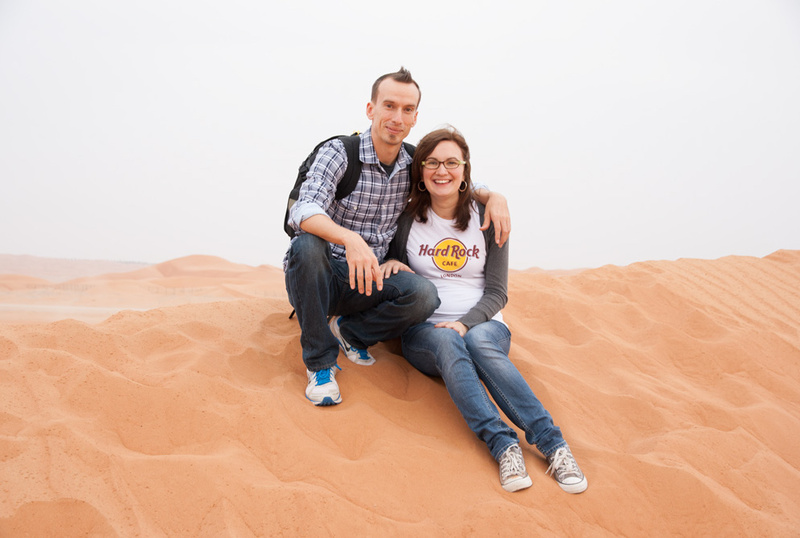 Shon and Jenia in the UAE desert a few months before the first of the little ones arrived! Also, despite the culture of the UAE being very different from that of the USA, we were able to make sense of the differences as they were rooted in Islam, which shares similarities to our Judeo-Christian heritage. In contrast, China has an entirely different religious background which is very difficult for us to relate to. What about food? In Shenzhen, China, there are places that sell Western foods, and there are restaurants that serve Western fare. They’re generally harder to come by than they were in the UAE, however, with the exception of Starbucks and McDonald’s, which are plentiful. Hands down, it was easier to find familiar grub in the Emirates than in China. An area of strong similarity between the UAE and China is government censorship. The UAE is artificially separated from the rest of the world due to state-controlled news media and a censored internet, and that’s even more true in China. Accessing most popular Western websites is impossible without circumventing the Great Firewall. Interestingly, most films from the West are released here, too. They are frequently edited if the content is deemed inappropriate, marking another point of similarity between the two countries. Just like in the UAE, criticizing the government is not a good idea. If you are an outspoken, critical of the powers-that-be sort, you might not be comfortable here (or the UAE, for that matter). For the average Joe, just going about your business and working within the rules, however, things are basically like they are anywhere else. What about the teaching experience? Here I work with Chinese students, and there I worked with Emirati students. Generally, the Chinese students I teach are much more respectful and far harder working than the Emirati kids. Another inevitable point of comparison is crowds. For the most part, living in Al Ain, there weren’t huge crowds or traffic jams, except maybe in a popular mall during peak hours, or, goodness gracious, the Starbucks drive-through line at Jahili Park. Traffic generally kept moving well. Al Ain had only half a million people, though. Accordingly, Dubai might represent a better comparison. Dubai had heavy traffic at rush hour and was very crowded in touristy areas such as the Dubai Mall. 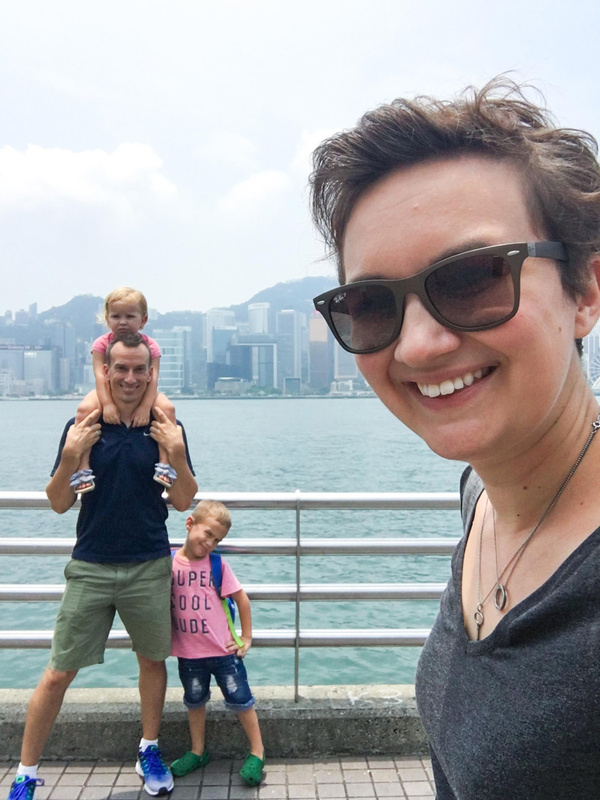 Shenzhen, China, has people practically everywhere, and if, for example, you go to a park on the weekend, it’ll be overrun with kite-fliers, picnickers, and, puzzlingly, sun-avoiders. Popular places are crowded most of the time, and traffic can be very congested. It is often loud and hectic, and that can be grating. Finding a quiet place was far easier in the Emirates. We met more teacher families in the UAE, too, and it was much easier to establish lasting friendships as a result. While this is a major difference, it also brings to mind a commonality: building meaningful relationships with people who have very different backgrounds (i.e., locals from either the UAE or Shenzhen) can be tough. In any case, this is an area which we give the nod to the UAE for, as we’ve found it harder to meet people from similar walks of life in China. Interestingly, China is a lot more “technology-reliant,” in Jenia’s words, than the UAE. The ubiquitous mobile payment platform WeChat comes to mind. Many vendors expect this kind of payment and have to scramble to find adequate change if you pay with a bank note. WeChat also offers a convenient online way to order food, buy tickets to the cinema, and much more. While we once thought driving in the UAE was nuts, driving in China is an exercise in lunacy. The principal thing that made UAE driving sketchy was the pedal-to-the-metal attitude toward freeways that many locals exhibited. That made accidents on the highway a lethal affair. Around town, there was definitely some eyebrow raising behavior, but it wasn’t to the extent that we witness here in Shenzhen on a daily basis. In city traffic vehicles pass illegally, drive on the wrong side of the road, cut each other off, park wherever they feel like it, and so forth. It’s amazing there aren’t collisions on a regular basis, and, frankly, if this kind of driving happened in the USA, there would be an epic outbreak of road rage and it would be quelled. Watch one of our Instagram stories showing how cars treat stop signs, if you like, for an idea of how road rules are treated. A final point of comparison: Shenzhen, China, makes a great jumping off point for exploring the world. We can fly affordably from Hong Kong to lots of fascinating South East Asia destinations. Likewise, one of the things we loved about living in the UAE was how easily we could hop a cheap flight from Abu Dhabi or Dubai to someplace else. As you can see, comparing and contrasting life as a teacher in Shenzhen, China, to life as a teacher in the United Arab Emirates turns out to be apt. There are many similarities, and we find things to like about living in China and also living in the UAE. Still, we found life in the UAE to be easier overall, largely due to more cultural touchstones and a wider use of English. If you’ve lived in both the UAE and China and would like to add something, feel free to comment below! Likewise, if you have any questions, ask away! For more stories about living China, check out our Life in China series. This was a very interesting post! Not only learning about the differences between the two countries, but I also had not previously knows you could teach English abroad with children! What company do you use for your teaching contracts? Glad to hear it, Marie. You sure can teach and travel with kids! We used TeachAway for one job, CRS Education for another (now called Explore CRS)–sort of–and the last one we just contacted the school directly.